A masterpiece of noir, Raymond Chandler's The Big Sleep helped to define a genre. Today it remains one of the most celebrated and stylish novels of the twentieth century. This comprehensive, annotated edition offers a fascinating look behind the scenes of the novel, bringing the gritty and seductive world of Chandler's iconic private eye Philip Marlowe to life. 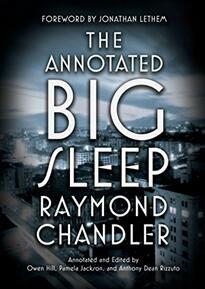 The Annotated Big Sleep solidifies the novel’s position as one of the great works of American fiction and will surprise and enthrall Chandler’s biggest fans. Owen Hill is the author of two mystery novels, a book of short fiction, and several books of poetry. He has reviewed crime novels for the Los Angeles Times and the East Bay Express. In 2005 he was awarded the Howard Moss residency for poetry at Yaddo. He is currently coediting the Berkeley Noir anthology, forthcoming in 2020. He works at Moe’s Books in Berkeley.